Hi this is Scott Strohm checking in and this morning we left Ngorongoro Crater. Our first stop was Olduvai Gorge. Then we drove on to the Serengeti. Again today we saw lots of animals. We saw two leopards in a tree and we also saw some lions in a tree today too. There was also a really huge male elephant. We saw some new animals – some Kopi, which is like an antelope. We had an amazing experience today with another great sunset. Francis is taking us to see some amazing things and Berg is taking very good care of us. We are anxious to show everybody all of our photos. See you soon. 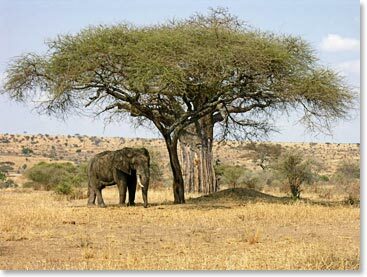 An elephant takes shade under an acacia tree. 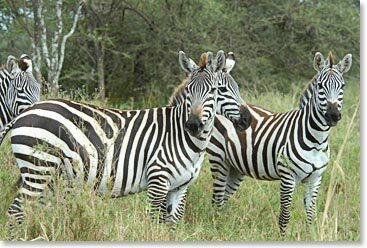 Zebras look curiously at the camera.